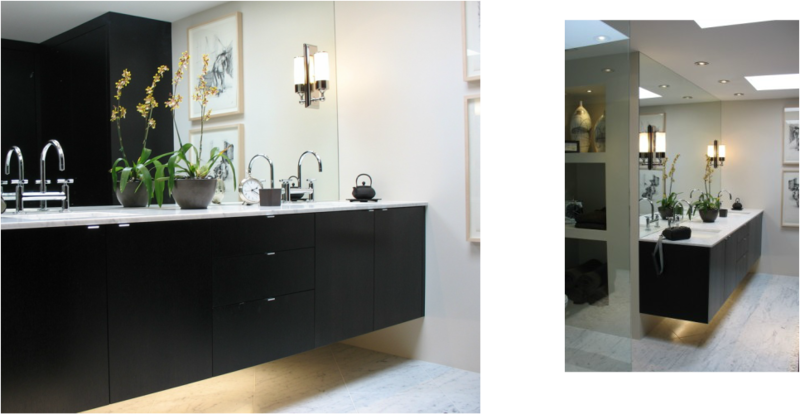 This bachelor's wall hung vanity has lighting underneath and was designed in ebonized quarter sawn oak to match the walk in closets of this closet-master bath suite. The closet-master bath suite was conceived by melding an existing bathroom and two closets in this East Bay penthouse along the San Francisco Bay. The Last Inch designed and built the closet-master bathroom suite's cabinetry, including the creation of a custom blend of leather dyes to attain the client's desired chocolate brown finish. Lace wood was a dramatic choice for this master bath. Materials used are warm in texture and color with the vanity as a statment piece in this spa like space. This vanity in ribbon grain mahogany became one of the clients favorite pieces. "The wood looks like fire". We created as many of this "fire mahogany" pieces as possible for their home in the Berkeley Hills . Kwila vanity and wall cabinet with burled California Oak and Ebony custom brass pulls in this Bodega Bay master bath complement the built-in armoire in the master bedroom.